In these challenging and unknown times, it is easy to lose hope. But can difficult times actually create more awareness and even a shift in consciousness? Can we in fact have an “evolutionary leap”? In Steve Taylor’s The Leap: The Psychology of Spiritual Awakening, we find that the world is always giving us opportunities for deepening our presence and awakening to the beauty and happiness that are always available to us. In fact, when our reality gets more intense and overwhelming, it can be an even bigger invitation to “wake up,” spurring an awakening process that we go through collectively as a nation and beyond. We hope you’ll enjoy these timely excerpts from Eckhart Tolle’s foreword and the book itself. Challenges are the lifeblood of all evolution. Every life-form, from plants to animals to humans, evolves as a response to the challenges it encounters. Your comfort zone is not the most likely place where you are going to find spiritual awakening, although the ego may tell you otherwise. If you look to people, places, things, or circumstances for fulfillment or happiness, you will be disappointed again and again. Don’t tell the world, “Make me happy!” You would be placing an impossible demand on it and condemning yourself to perpetual frustration. Instead, allow the world to make you conscious. You may find that every challenge, every obstacle that life seems to put in your path, is an opportunity for awakening, for becoming present, or for deepening the state of presence. Many challenges you encounter, whether of a personal or collective nature, will have been created by human unconsciousness, either your own or that of other people. Every seeming obstacle to your happiness or fulfillment is a potential portal into presence! Just modify your response to it and see what happens. Your life is not determined by what happens to you, but by how you respond to what happens. Most importantly, don’t add to the collective unconsciousness, which manifests particularly in the media and politics, through your reactivity. Bring the light of consciousness to every encounter, every problem, and every Facebook post! Life always gives you what you need, and right now it has given you this book to use as a guide or companion through challenging times. It contains a great deal of precious wisdom, expressed in the straightforward, clear, and down-to-earth language that Steve Taylor is so good at. I have a feeling that, by way of a miracle, it may even reach one or two people in the media and in politics! The big question: Can we wake up collectively in time? Can the positive traits associated with wakefulness transcend the negative traits associated with sleep before our present crisis leads to catastrophe? In relation to this, it’s important to remember that our own individual psyche is connected to — and influences — our species as a whole. When we undergo awakening as individuals, we contribute to the awakening of our whole species. Our own Leap is part of the Leap of our whole species. As more and more of us move toward wakefulness, the easier it becomes for others to do the same. The blueprint of the wakeful self-system builds up within our collective psyche until eventually it may replace the self-system of sleep as the normal state that all human beings naturally develop in adulthood. This is part of the reason why understanding wakefulness is so important, to help ensure that the people who undergo a sudden shift into awakening don’t feel confused and repress their state (and aren’t diagnosed as psychotic by psychiatrists). It’s imperative that wakefulness is allowed to express itself so that its positive effects — both for the individual and our whole species — can manifest themselves in the world. This is also why it’s imperative for us as individuals to follow our own individual impulse to awaken. It’s important for us not to suppress this impulse (perhaps under the misconception that making an effort to awaken is counterproductive) but to allow it to guide us toward spiritual practices and paths and consequently toward wakefulness. So long as we don’t become too self-conscious and too rigid in our spiritual practice — in which case, it may become counterproductive — we, in our gradual awakening, contribute to the awakening of our whole species. When we follow this impulse to awaken in an organic way we act as agents of evolution, helping to intensify the shift that is already under way. Our own self-evolution contributes to the process of evolution itself. Gradual awakening means practicing meditation and mindfulness, service and altruism. It means embracing quietness, simplicity, and inactivity so that we become comfortable within our inner space and learn to be. It means learning to quiet and disidentify with our random thought-chatter so that we know the peace of inner stillness and connect with our deepest nature. It means softening the strong boundaries of the ego so that we connect with other human beings, with nature, and with the whole cosmos. It means letting go of our psychological attachments to uncover the essence that they obscure and to allow our latent higher selves to emerge. And perhaps most fundamentally, gradual awakening means remolding our psyche, transforming the self-system of sleep into the self-system of wakefulness. There’s no reason why this should involve any individual effort. It’s not a question of pushing or striving, but rather of aligning ourselves with a process that is already under way, like allowing ourselves to float along with the fast-flowing current of a river. We don’t need to swim, just let the river carry us. And at the same time, in a symbiotic way, our own momentum will intensify the momentum of the whole process itself. The universe wants us to wake up and will happily guide us toward wakefulness, if we create the right conditions. Spiritual teacher and author Eckhart Tolle is the author of the New York Times bestseller The Power of Now as well as several other influential spiritual books. Visit him online at www.eckharttolle.com. 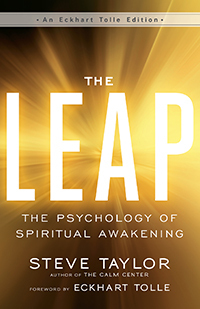 Steve Taylor is the author of The Leap and other books on spirituality and psychology, including The Calm Center. Since 2011, he has appeared annually in Watkins Mind Body Spirit magazine’s list of “the world’s 100 most spiritually influential living people.” Visit him online at www.stevenmtaylor.com. Excerpted from The Leap. Copyright © 2017 by Steve Taylor.